Today is my mother's birthday. In her honor, here is one of the few meat dishes that she still allows in her diet: braised pork belly, or _buta no kakuni_. It's amazing that she will still eat this, because basically pork belly is bacon without the smoke or salt cure. And in _buta no kakuni_ the bacon, I mean belly, comes in big chunks of layers of meat and unctuous pork fat. Pork belly recipes exist in other cuisines, especially around northern Europe, but I can't really stand most of them, even if people in Germany and Britain rave about roasted pork belly with crackling. (The crackling part is ok, but the meat part...I don't know.) I like fat in moderation as much as anyone, but that amount of gelatinous pork fat is rather hard to bear. That is unless it's been slowly braised in a salty-sweet liquid for hours and hours, until both the fat and the meat melt in your mouth. 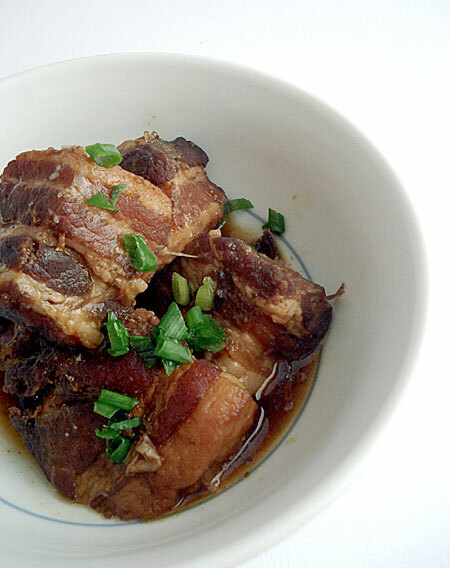 Very similar recipes exist in Chinese (from Peking-style especially) cuisine, and a great Okinawa speciality is rafute. This is a bit like rafute but has a bit more spice and things in it, so it's closer to the Peking style I think. Either way it's a great treat once in a great while. It's definitely a cold weather dish. A traditional Japanese way to cook pork belly. Cut the pork into cubes about 1 inch / 2cm or so square. If the skin is still on, leave it on. Heat up a large pot with a heavy bottom. Sauté the pork belly cubes, without any added fat (you don't need it...) until browned. When the meat is browned, scrape it to one side and put the sugar in the fat that's accumulated on the bottom, and stir around until it's a bit caramelized. Stir and toss so the meat gets coated by the sugar. Add the rest of the ingredients, bring to a simmer and lower the heat. Put a lid on and let it simmer gently for about 3 hours, turning occasionally. To serve, dredge the pieces carefully out of the very oily cooking liquid, and peel of the thick layer of fat that's on the skin side of the meat. Drizzle a little bit of the cooking liquid over the cubes. We have this with very plain vegetables, like broccoli with wasabi sauce. Storebought pickles or homemade 'instant' pickles are good to have too. Hot, plain rice is essential. To eat, take a small piece and put it on top of your hot rice, and let the sauce and fat sort of melt in. A little goes a long way. My mom is now in her 70s (as of April 2013), now, but still one of the youngest and spryest ladies in her 70s that I know - although she's had more problems in recent years with her health unfortunately (she's scheduled for spine surgery next month). She loves food, but since retiring a few years ago she developed a very severe case of IBD (we suspect it's due to the stress she went through when she was running a busy restaurant in midtown Manhattan), and really has to watch what she eats. Nevertheless she really enjoys life...often I'm not sure who's the mother, she or I! 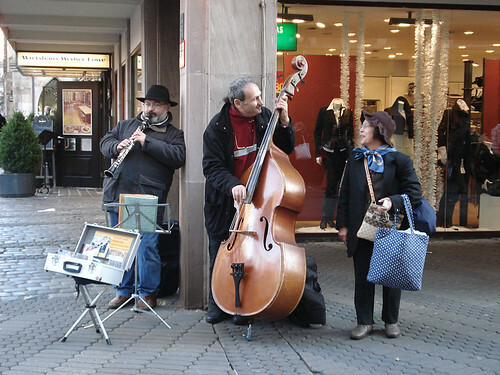 Here she is bouncing happily with some buskers at the Nurenberg (Germany) Christmas market in 2006. One thing that is great about her is that she brings a fresh sense of enthusiasm to everything. Whenever she comes to visit me in Switzerland or now France, I get to see things through her eyes, so that even in the throes of grey, dull winter in Zürich, life seems to be fun again. It's great to have a mother like that. Submitted by maki on 2007-11-07 15:42. Sounds delicious. I might have to get to my butcher's shop and pick up some pork belly this weekend and make this. Also, your mother sounds like the kind of person the world could do with more of. Happy birthday to her. This is interesting, because I just tried a recipe from Fuchsia Dunlop's book on Sichuan Cookery (I think it has a different title in the USA) called bowl-steamed belly pork with pickled vegetables. I didn't have quite the right picked vegetable. There are black beans in it too. I think there are tons of pork recipes in regional Chinese cuisine...pork is sort of the meat (or when people think of meat, it's pork)...same was true until fairly recently in Japan too. Yep my mom is the coolest person! My parents are from Taiwan, and every now and then my mother will make something like this--it's fairly easy, and it'll keep you fed for a few days. When I was a little kid, I didn't like it at all, but now, at the ripe old age of 24, I find it absolutely wonderful, the way the pork melts in your mouth. It's making me drool right now, especially since I'm in the grad school dorms. Oh, and the bento site is awesome! I used a bento box when I worked in Japan last year, but the meals never looked as good as these! I love your website.. !! We are chinese and this dish is atypical and often apears on our dining table when my mum wants to take it easy. Instead of browning it in the pan, we just blanch it in hot boiling water and that does remove some of the "porky" smell and dirt and fats. My brothers and I as kids love to drown our rice with the sauce and it's extra yummy over night too ! We would also add hard boil eggs into the pot and let it braised alongside with the pork. yummy ! Today I cook it often for my kids too and they too love it. And I've come to associate its smell and taste of home. Hmm.. comfort ! Keep up the good work wif your site ! Mmm boiled eggs would be great with that rich sauce! I do notice that a lot of Chinese recipes call for blanching meat or chicken first to remove some smell and things. Interesting! Recently, I went to an Asian store and noticed pork and beef shabu shabu. Can this type of meat be used in stir-fry or is it too thinly sliced for this type of dish? Shabu shabu meat can be used for stir fry, but you have to be careful to cook it very briefly, as you would for shabu shabu, or it can be a bit tough. You could add them at the last minute, or stir fry them first, take them out, then mix in at the end. I love the jaunty and stylish way she wears her scarf. 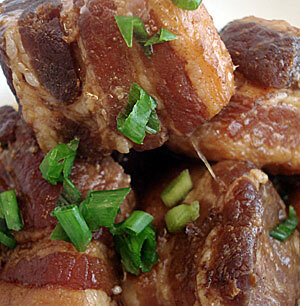 The one exquisite Chinese pork belly recipe is called Tungpo Pork. happy holidays to you and your family, best wishes for everyone, and many good thoughts for your mother-in-law! happy holidays to you too santos :) I hope the kakuni turns out good! Thanks for the recipe, i tried to make it last night and it was a great success!! drooly delicous!! I swear I'm not stalking you online. But your recipes are great! It is very similar to the Chinese version my mom makes, but because some spices are not available in Australia I tried your version with some substitution for the sake. I made a big batch, but chickened out at the last moment, removing the skin from half the pork. The fatty bits really had the melt in the mouth goodness - the part I removed the fat from was still good but slightly less juicy. Sigh ... I think I'm going to add some hardboiled eggs. I also cheated for this one, with 30 min pressure cooker (liquid doesn't reduce) and then another 15 min simmering to reduce the liquid after it was more tender. I only used 2 cups of water despite doubling the meat. Perfection. I had this dish at a restaurant and was craving it and found your recipe. It tastes JUST like it! I have also tried it at a couple other places since and the other ones were bland and less tender. Thank you so much for this wonderful recipe! I am keen on trying this recipe. May I know how big the 1 large piece of ginger should be? Thanks. I just recently tried this dish at a restaurant, and it tastes exactly like a vietnamese dish called Thit Kho. They even look similar! The vietnamese version is a little less sweet and is made with fish sauce and coconut water, and colored brown by a caramel coloring. That being said, both recipes are delicious! I have read about your mother having IBD. That´s my problem too. I have the Crohn´s Disease and my body reacts badly to any kind of animal protein. Similiar reaction like when you have an infect with germs you could say, but attacking the body cells. And yes, stress is a big problem. No wonder when you know that the brain developed from the same part of the fetus where the intestines are also formed. The digestive tract is a more primitive brain in the meaning of reaction to feelings..and that means reaction to hormones. And because animal produced hormones are so similiar to human ones(doping/medication) it is only logical that the colon also reacts to stress hormones found in animal products, not only the one the body produces itself. My granny is now in her 80´s and still has her own little house with garden..hope your mother will be so lucky/healthy too. I got the IBD from both parts of the family..in the time my grandfather had it, it was not diagnosed as such. IBD is relatively new, but i made some family research myself and with the things i found i can tell that the health problems which run in my family came from IBD. I love this dish , my mom's japanese and cooked it often . We never had it with star anise in it though , that's more like the chinese version. Oh I love Buta No Kakuni! I was so surprised when I first had it because it was tender enough to be separated with chopsticks. I'm looking forward to making this recipe again! Thanks so much! Thanks for the recipe. I was just looking up a bunch of different pork belly recipes but your post about your mother was beautifully written. She sounds like a great woman with a rich life! That looks absolutely delicious! Braising a pork belly must be a typically asian thing to do, as there is a filipino dish that looks very similar, called humba. So tender that you can cut the skin (gotta leave it on!) with a spoon. You are so right about needing lots of hot, plain rice -- it's simply essential and I couldn't imagine anything else with which to pair it. Thanks for this great recipe, Maki. You can also scrape some fat out of it every now and then to substitute the oil when you need to stir-fry something. Here again, a little goes a long way, and it imparts a delicious flavor -- but also some cholesterol, naturally :-) -- to what you're cooking. It's very typical here in Brazil to use this fat for stir-frying seasonings for beans (garlic, cumin etc.). I had this at a local japanese restaurant and today, for some reason, I began craving pork belly and immediately thought of this dish. I did not what it was called so I just googled "Japanese Pork Belly" and sure enough, I ran into this page. I look forward to trying this recipe! ps- your mom is adorable!!! There's a new Japanese izakaya in Lyon called Oto Oto. We went last week and had kukani among other things. It was very good and surprisingly, very similar to a Vietnamese dish called thit kho trung (translated as braised caramelized pork and eggs). I made this dish last night and it was Awesome! You are so right about having plenty of steamed rice. I served it with sauted Bok Choy fantastic!!! Hello! I recently found your site, and was very excited to see Japanese food recipes in English, because I live in Japan and have always wanted to make more Japanese food. My Japanese boyfriend loves buta no kakuni, so I thought I would try and make this for him. Unfortunately though, I think I must have done something wrong. I followed your directions exactly, but all that I ended up with at the end of 3 hours was really tough, over-boiled meat; not tender or juicy at all. Is there something I can do to prevent that?? My boyfriend doesn't think you can make good kakuni in only 3 hours--he makes really good kakuni, but it takes 6~10 hours! (Of course, in a pressure cooker it only takes 30 min, but we don't have one...) Please give me any advice you have! The key is the cut of meat. Make sure it has plenty of fat. Also, to shorten the cooking time make sure your meat chunks are not too big. Note that this recipe calls for 2 cm / 1 inch square pieces. 3 hours should be plenty for that size. I make this recipe every 2-3 months. It's absolutely great, but so rich I can't eat it often. Thank you so much for posting it. I've found that while it's very good after braising for 3 hours or so, it's so much better if you refrigerate it and have it the next day. I have a massive pot on the stove ready for tonight. I didnt read the recipe properly and did not cut it into cubes...Hope it will turn out ok. I used your recipe last time and cut it - it was delicious and i am sure this will be too. I live in the Middle East and we do have our own version of winter. Today it is bright but the air is crisp and when the sun sets, it can get very sharp outside...so this is perfect for a day like this. PS: your mum looks like she is having a great time. My mother is 70ish and is still so sprightly. Must be the asian genes and generous amounts of buta no kakani!! Just made this with an extra pork chop I had left over from making tonkatsu (quantities and time adjusted to suit) and it was delish! Never really had sweet meat before but it was so nomable! I just discovered your FB page and it led me here. Loving your posts. And how is your mom? I have personally done 3 spine surgeries in my life to remove tumours, I had to learn how to walk again 2 times. Do update us on her health. It is so heartwarming to read you sing high praises of your mother. One perennial favourite. This wouldn't work with completely lean meat would it? It wouldn't work at all with lean meat...it's all that fat and collagen that makes it what it is. The wonderful scent of pork and star anise cooking is filling up the house and I want to eaaaaat it nooow! Amazing. This recipe is really good. I tried it at home and i was really great. IT really really tastes amazing.